Wendy, a licensed Realtor®, has been supporting teams in administrative functions for more than ten years. With extensive customer service experience, Wendy will work hard to ensure that your property gets full marketing exposure. A native of New Jersey, and a graduate of Clemson University, Wendy moved to Annapolis in 2012. 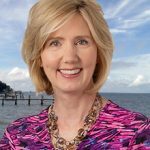 In her spare time, she enjoys exploring the Chesapeake Bay with her two sons. Her desire to ensure customer satisfaction at every level makes her addition to The Mr. Waterfront Team an advantage to you!